CEBU CITY, January 14 (PIA) -- The Cebu City Police Office (CCPO) urges the public to help ensure no untoward incidents will occur in tomorrow’s Sinulog Mardi Gras by avoiding pushing and shoving that might result to a possible stampede. 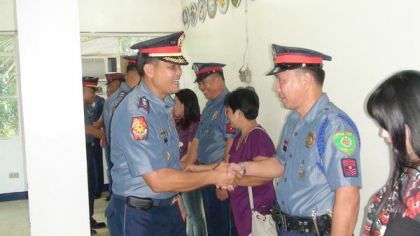 CCPO Director S/Supt. Melvin Ramon Buenafe said they will take extra preparation on this possibility, adding 100 percent police visibility in areas mostly jam-packed with huge crowd. “We have already asked assistance from universities and colleges to help the AFP-Central Command in crowd control by sending students and trainees as well as help regulate revelers in critical areas where people are tightly gathered,” Buenafe said. Chokepoint area cited include the Fuente Osmeña Rotunda, General Maxilom Avenue and the Cebu City Sports Complex (CCSC), where most number of judges are based. “We are going to deploy many personnel in the CSCC grand stand and I am also giving instructions to personnel assigned there to allow no one to stay in the front railings, including the passage way to the top bleachers,” Buenafe said. Along the Sinulog route, especially in critical areas, the CCPO posted tarpaulins which lists PNP hotlines and other emergency numbers for the public to report in case of accidents or any unfavorable incidents. Earlier the CCPO already conducted a dry run through the sections of the Sinulog carousel route.